The video for “Past the Mission” matches closely the religious theme evoked by Tori in the song. Indeed, she was inspired to write it after visiting the Native American pueblos in New Mexico, where she wrote and recorded her second album Under the Pink. Spanish conquistadors such as Cortez went there in the 18th century to christen the Native tribes, and Tori was struck by the influence the Church still had on the Native people nowadays. As a Methodist minister’s daughter who felt the weight of Christian guilt during her youth and a woman of Cherokee descent by her mother, this struck a powerful chord in her and she tried to translate this very particular vibe in the song. The song in itself talks about the necessary balance between the feminine and masculine principles through the story of the alleged relationship of Mary Magdalene and Jesus. Legends about the true nature of their relationship existed for centuries and some people think they were married and that when Mary Magdalene went to the South of France in Saint Baume, she was pregnant with his child. Essays and theories evolving around this subject grew stronger when four apocryph gospels and other Gnostic scriptures were found in Nag Hammadi in 1945. These texts - among which was The Gospel of Mary Magdalene - shed a new light on some of the Early Christians, Jesus’ teachings and his relationship with Mary Magdalene, who is said to be his favorite disciple. Tori always referred to Mary Magdalene and the sacred prostitute archetype in her works to claim back the passionate and sensual feminine figure that was circumsized from the Christian Church. Instead of dividing women into virgins or whores, holy or sinful creatures, Tori went back to ancient myths and mythologies to convey the image of a whole woman, who presents herself as both spiritual and sexual. Tori “steered Jake Scott, the director, into thinking Spain and the vibe” and he drew inspiration from the latin and conservative Catholic atmosphere to imagine the storyline. 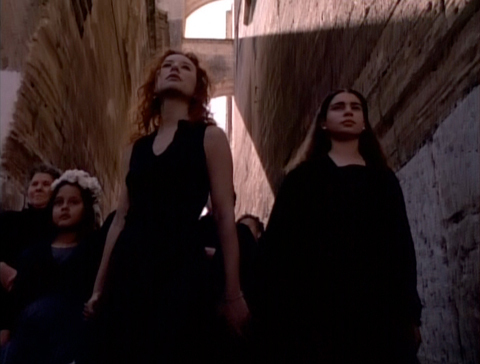 The video pictures Tori as an alter-ego of mythic figures such as Mary Magdalene or the love goddess Venus marching through a Spanish village accompanied by a little girl and a teenager. The parallel with the conquistadors is brilliant, except she doesn’t come to christen people but to free them. As she walks through the village, women come to follow her whereas men watch them sternly. 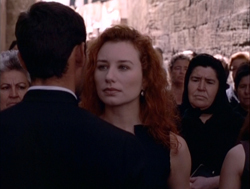 In the end, Tori and the women confront an handsome priest who stands in their way behind the church. After a long and intense moment where they stare at each other, Tori proudly defying him with her gaze, the women lie on the ground in a narrow passage and force the priest to litterally walk over their bodies to join the men of the village, after what they get back up on their feet and leave the village through the fields. 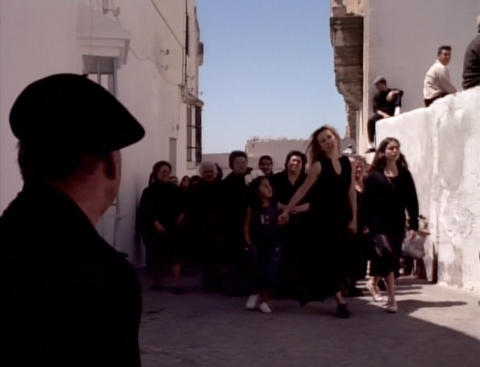 Ambiguous in the first place -why the hell would these women lie in front of a priest when they seek freedom?- this moment is utterly brilliant because the priest’s mission is located at the exit of the village and the church is their last obstacle before they can actually leave. The fact that the women lie down is a form of protest against the Church’s behavior in this case. The fact that the priest goes over them to join the men is meant to show that he lost the battle: he can’t stand in their way anymore and goes with the men inside the village to let them go. The women gone, the men and the patriarchal structure are left alone. It illustrates powerfully the biblic expression “over my dead body” while symbolizing the women’s ‘dead bodies”: by making feminine sexuality sinful, organized religion divided them at their core. In the chorus, Tori sings, “Past the mission/behind the prison tower/past the mission/I once knew a hot girl/Past the mission/they’re closing every hour/Past the mission/I smell the roses” and refers to the hot girl in her that was lost with religion as well as the hope to be passionnate again because she can “smell the roses” (the rose being a common symbol for Mary Magdalene and Jesus). The end of the video is hopeful as the women get up and smile at their victory, Tori leading them through the sunny fields and toward freedom. There’s also a revolutionnary vibe in the video, and it seems like it’s supposed to happen under Franco’s regim (there’s a reference to that in one of the tags on a wall).